Kevin Henry from the Coleman Country of County Sligo, Ireland is a tradional flute, tin whistle, uilleann piper and a wonderful story teller. Kevin Henry was born March 29, 1929 in the Mayo/Sligo border townlands near the town of Tubbercurry in Ireland, and from an early age was keenly aware of the musical traditions around him. He took up the tinwhistle around eleven years of age and then learned the flute after repairing an old one that had been given to him. From that point forward he practiced and added to his repertoire as he listened to musicians and attended local dances, feises, and competitions. Kevin worked as a laborer in England for six years like his father and neighbors before him. In England, he took up the war pipes so he could be heard in the dancehalls where he and a snare drummer would play the Siege of Ennis and many waltzes. After emigrating to Canada and then New York he made his way to Chicago where he labored as an ironworker on such notable skyscrapers as the John Hancock, the first National Bank and the IBM building. In 1956 Kevin was one of the founding members of Chicago's chapter of the Irish Musician's Association. He has performed for over 40 years at local Chicago venues and in concerts. In the 1950's he was a member of Chicago's Irish Guild Players. In 1996 he appeared in the Goodman Theater's production of Eugene O'Neill's A Touch of the Poet with Brian Dennehy. In 2000 Kevin appeared in "The Well" during the Dublin Theater Festival and in 2001 he was awarded a Fellowship in the Traditional Arts from the Illinois Art Council. At the age of 73 Kevin continues to perform each year at Celtic Fest in Chicago at sessions of Irish traditional music in Chicago and in Ireland. 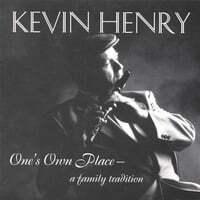 One's Own Place contains 23 tracks of Irish traditional music and recitations from Kevin Henry who plays flute, tin whistle and uilleann pipes.He is joined on several tracks by his daughter Maggie Healy (nee Henry) flute, tin whistle, fiddle; sister, Verona Ryan (nee Henry) fiddle; brother, Johnny Henry, fiddle and life long friend on bodhran, Malachy Towey. Among the many sets of reels, jigs, hornpipes, polkas are Kiss the Bride in Bed/Lady of the Island; Pipe on the Hob/Tom Hearte's; Biddy McGhee/The Moving Bogs of Powellsboro and The Ballymote/The Rooskey. Kevin Henry is a master storyteller who performs what are known in Ireland as recitations. He performs Guilty or Not Guilty, The Hellbound Train, Rex, Peg Kelley's Black Cat and The Green Eye of the Little Yellow God. Kevin also performs one song in the unaccompanied sean-nos style, My Little Thatched Cabin.